The big winner at this year’s Effie Awards Chile Gala was Transbank and its agency Leche. They took home a Gold Effie, as well as the Grand Effie, for their Redcompra “Trilogia de Solistas” campaign. The entries were judged by a panel of nearly one hundred members. The jury was chaired by Pedro Hidalgo, Senior Marketing Professor and Head of the Global MBA at the University of Chile Business School. The Grand Effie trophy was delivered by Neal Davies, President & CEO of Effie Worldwide, and Hector Hermosilla, President of Valora and head of the Effie network in Chile, Argentina, Brazil, Ecuador and Peru. The trophy was presented at the pinnacle of an awards ceremony that gathered over 700 marketing industry attendants. Among the attendants to the Awards Ceremony were the heads of Effie Argentina, Effie Colombia, Effie Costa Rica, Effie Ecuador and Effie Peru. 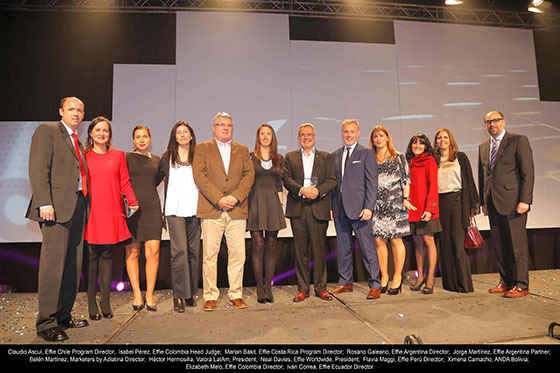 The Effie Awards Chile receives institutional sponsorship of the six marcom trade associations in the country, namely, the Chilean associations of Advertisers, Ad Agencies, Media Agencies, Direct Marketing and Relational Agencies, IAB ( Digital Agencies ), and Marketing Research. A complete list of the 2015 winners can be found here.